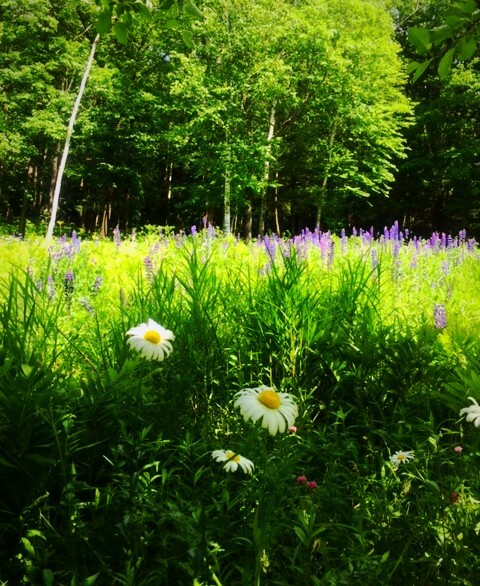 I hope you are having a wonderful Summer, and enjoying all the fresh local produce that July brings forth – I was so happy to receive our first local corn of the season last week from my wonderful CSA farm membership. I highly recommend the Roxbury Farm CSA; if you’re on the UWS, their farm distribution is on Thursdays from 4-7 pm at 86th Street & WEA. Memberships are seasonal, but they may be still accepting members as it goes through the Fall. For more information, please see http://www.roxburyfarm.com I have been a member for years, and it is still a treat to pick up my weekly farm bounty (I split my membership with a friend). CSA stands for Community Supported Agriculture and our memberships support the work and future of these local, small, organic farms. I am delighted to be teaching at UWS Yoga & Wellness again the next two weeks! Join us at Noon on Thursdays, July 26 and August 2 for Level 1 Core Strength Yoga which is a fusion class of pilates and yoga poses. We utilize small, soft exercise balls to assist with low back support but also to increase the abdominal strengthening. Back strengthening is included, as well as standing balancing poses. We will focus on alignment and breath-centered movement so that strengthening is practiced in a safe, functional and effective manner. Learn how to effectively strengthen your core without doing abdominal crunches! Class ends with yoga nidra/savasana to fully relax the body and spirit after our total body workout. Hope to see you there! Check out http://www.uwsyoga.com for more information. Wishing everyone a happy Fall and if you celebrate it, Happy Rosh Hashanah! I am teaching over the Jewish holidays, but am away on Monday, October 10th – Columbus Day. This month, in addition to my regular weekly classes, I am teaching on Wednesday morning October 19th – Level 1 Hatha Yoga at UWS Yoga & Wellness. Also this month, I teach a “Strong to the Core” Yoga Workshop at Integral Yoga Institute on Monday night, October 17th. At this workshop, you will learn safe and effective ways to strengthen the core, especially the hard-to-reach lower abdominals. Strong abs make balancing poses easier and are the key to a graceful posture. In this workshop, you will learn abdominal exercises that are alternatives to traditional crunches, thereby preventing any neck or upper-back tension. The 2-hour workshop also includes back-strengthening poses, as well as a focus on standing balances. Enhance your yoga practice with a strong center! This workshop comes with a take-home outline. I hope you can join me! 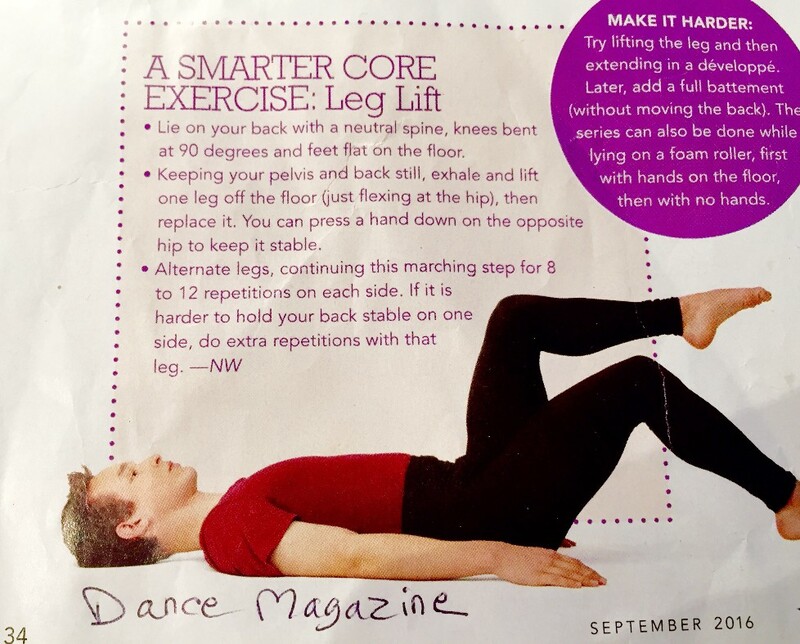 I was super excited to see an article in last month’s Dance Magazine (see below) that depicts and recommends one of the core exercises I give in all my classes! The wellness editor of http://www.4dancers.org , Jan Dunn, writes that simply doing ab exercises can lead to “key weaknesses in supporting the whole body in action” because “core control is much more than just abdominal strength.” Her “favorite” exercise is below as true core control includes “back stabilization, and involves the coordinated effort of several different muscles in the torso to stabilize the spine.” I agree, and for those reasons, my personal practice and my classes focus on these type of exercises rather than traditional sit-ups. In my weekly Tuesday class at UWS Yoga & Wellness, instead of using foam rollers as mentioned in the article, we use soft medium-sized exercise balls under the low back and buttocks to create an unstable surface on which to balance and to protect the low back muscles while strengthening the core. The effect and the results are similar to using the roller, but the balls are more portable and easier to store if there are space limitations. I love to travel with my pilates ball, as it is deflates and weighs next to nothing, and it can also be used as a back support in your car or on the plane.